What Day Of The Week Is September 29? 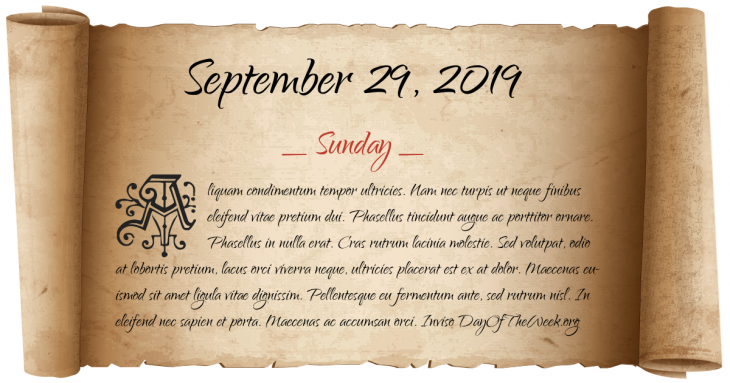 September 29, 2019 is the 272nd day of the year 2019 in the Gregorian calendar. There are 93 days remaining until the end of the year. The day of the week is Sunday. The Metropolitan Police of London, later also known as the Met, is founded. Battle of Pákozd: stalemate between Hungarian and Croatian forces at Pákozd; the first battle of the Hungarian Revolution of 1848. World War II: Holocaust in Kyiv, Soviet Union: German Einsatzgruppe C begins the Babyn Yar massacre, according to the Einsatzgruppen operational situation report. The convention establishing CERN (the European Organization for Nuclear Research) is signed. 20 MCi (740 petabecquerels) of radioactive material is released in an explosion at the Soviet Mayak nuclear plant at Chelyabinsk. The Chevrolet Camaro, originally named Panther, is introduced. The 1982 Chicago Tylenol murders begin when the first of seven individuals dies in metropolitan Chicago. Construction of the Washington National Cathedral is completed. The asteroid 4179 Toutatis passes within four lunar distances of Earth. Who were born on September 29?